Received two more cassette tapes from Rinus van Alebeek and his staaltape label 4th July 2017. Here is the first one. Unit Audio is by Ben Roberts, a creator we have not heard from before; English, living in Madrid. He’s a collector of of old magnetic tapes for about as long as he can remember and is apparently holding a “huge archive of found tapes”. This may mean he’s not unlike Mark Vernon, another UK tape-hoarder and manipulator who we recently noted with his LP of findings from flea-markets. 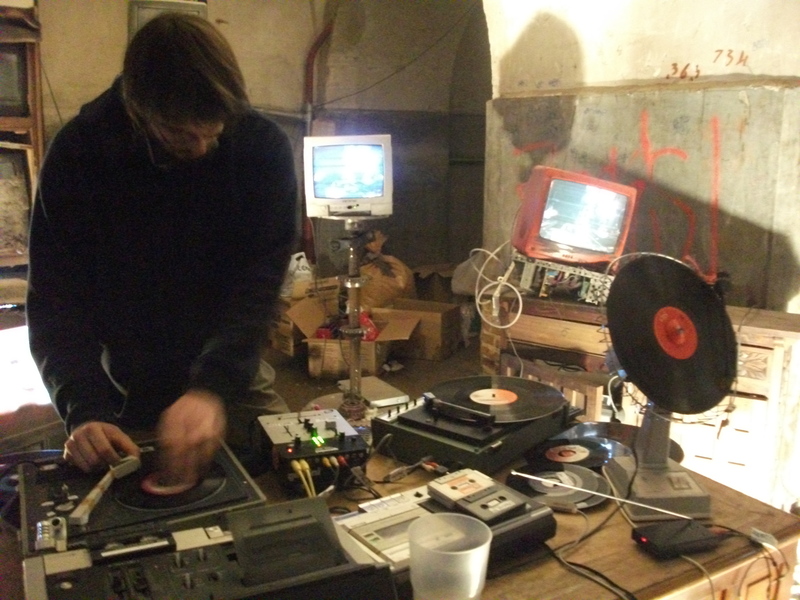 Like Vernon, Ben Roberts is interested in tapes that have been discarded, neglected, or forgotten; and like many tape machine buffs, he loves glitches, artefacts, machines going wrong, and these mistakes and errors contribute to the surface effects of his art. Besides Mark Vernon, I’m also tempted to liken him to Fossil Aerosol Mining Project, whose LP for Helen Scarsdale is a classic entry in this “genre”; they too scavenge for lost reels (and include cinema media in their hunting sessions) and “physical disintegration, damp, tape-rot, poor splices, scratches, dropouts and accumulated dirt, dust and grit” are all welcome additions to their aesthetic. However, the Fossil Aerosol people are quite benign, passing on a very optimistic and nostalgia-tinged view of the past with their sound art. Ben Roberts does this too to a certain extent, but he also seems to be seeking something rather less obvious, signs less commonplace. I might even say there’s a faintly cruel and unpleasant side to the things he uncovers through his methods. He may exhibit an interest in the past effluvia of our civilisation, but he’s decidedly ambivalent about whether or not these things are good. At least twice on this tape I felt I was hearing something I really should not be hearing; I have no idea what the source for it may have been, and I don’t want to know. Unsettling, nasty even. Again, Mark Vernon has veered close to this darker side himself on occasion, through retrieving dictaphone tapes and answering machine messages which probably should have been erased a long time ago. This is evidently a powerful method for reaching a psychological depth which is otherwise hard to access; and it’s more than just a simple “confessional”. Somehow these tapes allow us to see the cracks in the mask, see through to a more profound truth, one which may not even be especially palatable. At one point on side one of the tape, there’s a slowed down voice simply listing years: “1973…1974…1975”. There’s something ghastly about the tone of the voice that nauseates and terrifies; it’s the sound a time-barrier to the past being opened up, but we don’t want to go back to the 1970s. It might be a very unpleasant time. In this moment, Unit Audio issues a stern corrective to those of us (myself included) who wallow in nostalgia for a so-called golden age. Be careful what you ask for, says this voice, I might just transport you back there. Unit Audio is not completely a nightmarish experience, though. For the most part it’s simply eerie – with its careful juxtapositions, edits, loops and tape-mangling actions, it succeeds in representing the real world through a decidedly skewed lens, a vast distorting mirror. There are things we can recognise – snatches of pop songs, extracts from film or TV soundtracks. Such moments serve to anchor us in some sense of reality, while Ben Roberts continues to spin his imaginative fictions. Perhaps “mangling” is too strong a word; van Alebeek is, I think, quite right to praise the “delicacy and awareness in attitude towards the use of found material” in this work. There have been plenty of people doing the shock-value thing with collision edits and wild juxtapositions; their work doesn’t have much impact after the shock has worn off. Van Alebeek has never, to my knowledge, entertained such a creator on his label. The tape is presented to us as “combinations that produce meanings above and beyond anything the individual parts may have had.” I think this is highly significant; it might indicate something about how we shape our culture, assigning meanings to individual fragments of experience. Maybe nothing really happens to us at all, unless we can turn it into stories or fictions of some kind. After all, every sociologist and his wife are always telling us we need narratives to “make sense of the world”, as they so patronisingly put it. What interests me about this tape by Ben Roberts is how we stand a chance of seeing that very same process in action. If he has done this, it’s a remarkable achievement. Plunderphonics never sounded so cared for, so labored over, as it does on British expat Ben Roberts’s UNIT AUDIO. 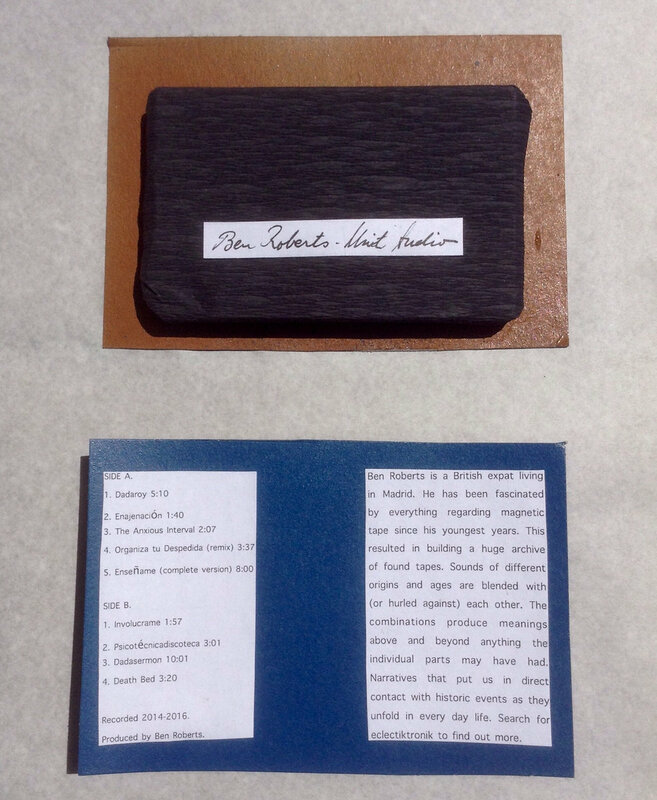 The now-Madrid-dwelling Roberts has amassed a collection of cassette tapes that he discovered over the years, and the archive serves as the inspiration and the source material for his cassette on Staaltape, the Berlin label run by Rinus van Alebeek and focusing on sound art. Let’s just say that UNIT AUDIO is freaking cornucopia of found sound, pieced together for maximum weirdness and instant likability. It starts strong and stays strong, continuing on its path toward greatness minute by warped-audio minute. Ever thought you’d hear somebody talk about musique concrète that way? What does UNIT AUDIO say about Ben Roberts? It affords a peek into his imagination, surely, where the source material swirls until it coalesces into a sensible whole. Roberts invokes the idea of sehnsucht, meaning there’s a “yearning” or a “longing,” a sense that something is missing or imperfect and that something’s presence will restore the whole. UNIT AUDIO is restless, a time capsule, multiple snapshots of human life superimposed on one another in a confusing mass, the disorder, perhaps oxymoronically, satisfying in its turmoil. The whole is here. What’s missing is within us. He salido a dar una vuelta por este barrio mío al que acabo de adscribirme, esperando volver a encontrarme con esos entusiastas -quizá no tanto- del noble arte del espigueo, práctica esta venida a más en estos últimos tiempos que corren malos, malísimos, para la lírica del desconcierto alimenticio. El espigueo no es más que la recogida de alimentos desechados por unos que han considerado inservible lo que bien puede no serlo para otros. En ocasiones me dan ganas de acercarme y asaltar los contenedores como ellos, ¡espigadores!, pero mi distanciamiento no me hace presagiar buenos augurios en tan infinito mundo -el del contenedor, que semeja ingente archivo de, ¡sorpresa! : calidad. Parece que éstos albergan gran cantidad de insospechada materia, aunque realmente la sorpresa, o desconcierto, venga por el desconocimiento que poseemos de mucho del material que hace del vertedero un cementerio de ilusiones. Sito en esta plaza como estoy, tengo una vista privilegiada de la fuente carroñera que le permitirá a alguno irse a casa -en el mejor de los casos, y brindo por ello- con las manos bien llenas de los despojos de otro; y es que este acto mío de vouyeur de los excluidos se emparenta con una cinta a reivindicar, ensalzar, celebrar, como es Les glaneurs et le glaneuse (Los espigadores y la espigadora), de Agnes Varda, una señora que nos permite conocer la dura vida en los márgenes de una sociedad que no percibe el despilfarro de (sus) recursos. Ya sea la pitanza o el arte -ambos se degustan-, las fuentes se malgastan con tal facilidad que el espectador que (re)descubra los actos con los que se vienen engordando la tala de masa forestal, la carestía de las fuentes de hidrocarburos, la modificación del clima, etc. no sentirá más que el fracaso de una sociedad varada en el capitalismo. Agnes Varda, que comenzó su andadura en 1955, se propone partirnos la jeta de un sopapo con esta película que tiene momentos de enorme valía, gracias a unos episodios que le permiten elaborar una cartografía de desamparados y friganistas. Y es en la unión de los pasajes, esos intersticios que laten vida, donde nos regala la visión de una persona próxima a la muerte, pero plena de la vitalidad propia de los niños; un ser que desea filmar el transcurso de la vida, sin exclusión ni reparo para aquellos que se han -o los han- apeado del furgón de cola de la sociedad. Puesto que en estas columnas se aúna el cine con la música -o viceversa-, llegado este monento alguno de las valientes que hayais aguantado os preguntareis con qué se va a relacionar Los espigadores. De acuerdo, la espera -os lo puedo asegurar- ha merecido la pena, porque hoy traigo uno de los secretos mejores guardados de este país (todo esto es matizable). Eclectiktronik, uno de los alias de Ben Roberts, es un tipo que desarrolla instalaciones sonoras y audiovisuales utilizando, fundamentalmente, restos electrónicos, grabaciones de audio y vídeo de desecho. ¡Vaya!, así que también hay espigadores electrónicos que recuperan material para suerte de la música o la práctica sonora. ¡Al loro con lo que predica su página web!, https://eclectiktronik.wordpress.com/ en la que podéis escuchar, aprender y descubrir parte del lado oscuro del capitalismo: “el uso de estos objetos encontrados y modificados – los restos de una sociedad de consumo exacerbado -refleja una postura y una metodología de producción crítica, y un afán por la casualidad, la espontaneidad y la improvisación”. Para aquellos que duden, les mastico un poco esto. La noble práctica del espigueo reside en recuperar tocadiscos, magnetofones, altavoces, alguna mesa de mezclas rústica -rustiquísima si se me permite-, discos de vinilo rayadísimos, cintas de casete con grabaciones personales -entrevistas, contestador automático, etc. ; para modificarlos alterarando su frecuencia (pitch) de un modo simple, o creando drones (colchas ambientales ligeramente siniestras, paisajísticas) marcando en los discos el punto de salto de la aguja y repetición para crear un bucle (loop). El caso es que cualquiera de vosotros estará conformando en su cerebro esa palabra de nueve letras que describe a la perfección el resultado sonoro de todo lo anterior: cacofonía. Pues no, ya que el que tiene la opotunidad de escuchar en vivo una puesta en escena de Eclectiktronik –se prodiga poco la verdad- sale gratamente sorprendido por cómo suena la colisión de elementos tan dispares. No es tan sólo una cuestión de resistencia ante el avance de la tecnología, sino que el collage sonoro es lo suficientemente evocador (las voces grabadas hacen que navegemos imaginando sus dueños), rítmico (los bucles no son azarosos), o planeador (drones a modo de mantras) como para afirmar sin duda que lo que se está creando a partir de desechos es música. De la misma manera que los espigadores recogen -directamente de los árboles en el campo o de los contenedores en la ciudad- el excedente alimenticio que les da la energía necesaria para transitar por este mundo por el que muchos vagan cámara en mano; una suerte de artistas furtivos se plantean la praxis como un algo más allá del resultado, más allá de la belleza. Un terreno nada baldío donde la resistencia, cual jinete ante la tormenta final, no es sino puro acto vital -como algunos de los que pululan por la película- que (nos) informa que más allá del mar habrá un lugar donde el sol, abrasador, cada mañana (nos) ciegue más. On Saturday Hisae and I visited an installation by Ben Roberts, a British sound artist who lives in Madrid. At Radio Aporee, a gallery / living room on Bürknerstrasse, near our house, Ben had assembled some old cassette players fitted with wand-mounted VCR heads capable of reading — turning into gloopy sound — any kind of information stored on magnetic tape: the stripes on credit cards, the backs of metro tickets, old computer spools, and of course audio tape. Instead, I swiped the lengths of tape Ben had assembled on the gallery walls; Madrid metro tickets, old language-learning reel-to-reel tapes, ancient computer data. These all had their own distinct sounds, and were mounted on different colours of paper. It was easy to hear them as drumkits (the computer data was particularly rhythmic), vocals, solos, and so on. Soon Hisae and I were jamming “tape jazz” as if it were the most natural thing in the world. Desgraciadamente(o no) el tiempo se nos pasó volando, y aunque nos hubiera gustado ver otro trabajo de Brandon Labelle, tuvimos que ir acercándonos al local de Cake & Coffee records, donde teníamos la segunda actuación, esta vez fuera de Tuned City pero todavía dentro de Das Kleine. Tal como le gusta a Rinus, dejó que las cosas pasaran por sí solas y sin orden ni hora fija. Así fué. Harold Schellinx puso una pequeña exposición con sus “found tapes”, cassettes encontradas, mientras ahí mismo enseñaba y editaba algunas de ellas. Sin programa fijo pero sin parar. Me recordó el proyecto migration tapes de la amiga ZÃ¶e Irvine. El norteamericano actualmente residente en Madrid Ben Roberts nos explicó su trabajo, e hizo una demostración de las cassettes que encontró en el mercado de segunda mano de Berlín. Sin grandes intenciones ni pretenciones, nos pareció un trabajo peculiar y agradable el suyo, y por lo poco que pudimos conocerle, como Ben mismo.Nuestra presentación fue aún más informal. Aunque en un principio utilizamos radios para enseñar los archivos de Soinumapa, al final, y para aprovechar el buen tiempo, pasamos la tarde hablando con Rinus sobre los aproyectos de Audiolab(entre ellos Soinumapa), Arteleku y otros temas. Oier también sacó su ordenador y el amplificador, y puso banda sonora a la entrevista. Más que un concierto o una conferencia, fue una especie de programa de radio improvisado, y todos lo pasamos fenomenal.